The development of applications and solutions that help and improve public safety operators’ daily work has been rapid lately. This has led to a situation where traditional public safety narrow band connectivity seldom meets the applications’ requirements today and in near future. This all has been acknowledged by everyone involved in our field. However, there are some misunderstandings and misconceptions of what the connectivity requirements of future will be and even more of what the most beneficial and useful applications and services will be. I will highlight in this short article what type of services are the ones that bring public safety operations to a totally new efficiency level and what type of connectivity only assures that improvement. The most common mistake any organization makes in developing and implementing the new services is either to take good connectivity as granted or to develop services where connectivity is not crucial. This seems controversial that both of these approaches are wrong. Let me explain. Often organizations that have first experimented with broadband have come to a conclusion that they cannot rely on the single connection they’ve used and thus develop services where broadband is only “nice to have”. If it’s not there it doesn’t matter, because the connection problems can be replaced with local data storage or by postponing the required tasks to be executed in the office. This has led, as an example, to applications where cameras record everything but the data is saved locally and can be recalled then later in the office. This might be a good thing for the public interest when evaluating actions and procedures, but no use what comes to operational support. Another example is the paperwork on the road. If there is not always connection. the documents need to be downloaded later and there is no possibility to check the background information often needed to fill in all the documents. This often leads to reluctance to actually perform the tasks in the field and they are postponed to be done in the office. Both of these examples, as being improvements for sure, don’t bring the change in efficiency expected by the investors. The key to significant efficiency improvement is the always online connectivity. If the users can be certain that the connectivity is there, the whole operational picture changes. Some of the users claim that the always online connectivity has brought a change that has been “bigger than changing from horses to cars”! How can this be achieved then? The first example is the video streaming. With online video streaming the whole concept becomes a command and control solution. Wherever anything worth sharing happens, the unit in the field can share the view with the headquarters and with any other task relevant units. Data is shared online and in this case a picture is truly worth thousand words, minimizing also unnecessary voice traffic. Also recording is possible in this scenario, but the application and use is totally different and recording can happen in vehicle or command and control center. In some countries the camera in the vehicle is already considered the “third officer” due to its capability in information sharing! Online video streaming is one of the high end solutions, but there are many more significant ones. The real efficiency improvements, when talking about saving time, come from using the vehicle as an office. When the connection is there one can always check any required background info from vehicle registers, customs, criminal records, tax registers; everywhere the officer has rights to. Also the required documents can be always up to date and filled and saved directly in the databases. This means one has to do the work only once. Think of the time savings achieved in writing a simple speeding ticket! In some scenario you can use the bank card to pay the fine on the spot even. We calculated with a client that this online capability saves 1,5 hours every shift in the vehicle. This means yearly savings of approximately € 100 000, - per vehicle per year! Being online to a level that you have uninterrupted broadband connectivity brings the benefits and savings. Any half-baked “low end” connectivity solution that jeopardizes the connectivity also risks the whole investment. How to then make this happen? One would think that only dedicated country wide LTE network would be the only solution. On the contrary. As a dedicated network brings added resilience and can help to minimize congestion issues, it never provides the only solution. The best way to realize this is to combine available networks in a smart way. Luckily we have already great examples of the solution. Norway, Finland and Iceland have implemented solutions with only commercial networks, using 2-4 networks depending on the area. Many Middle East countries have selected the dedicated network path supported by one or more commercial operators. The hybrid network approach offers also a very nice evolution path to the dedicated network builders as one does not have to wait until the own network is fully implemented. One uses the dedicated network when available and other alternatives when not. 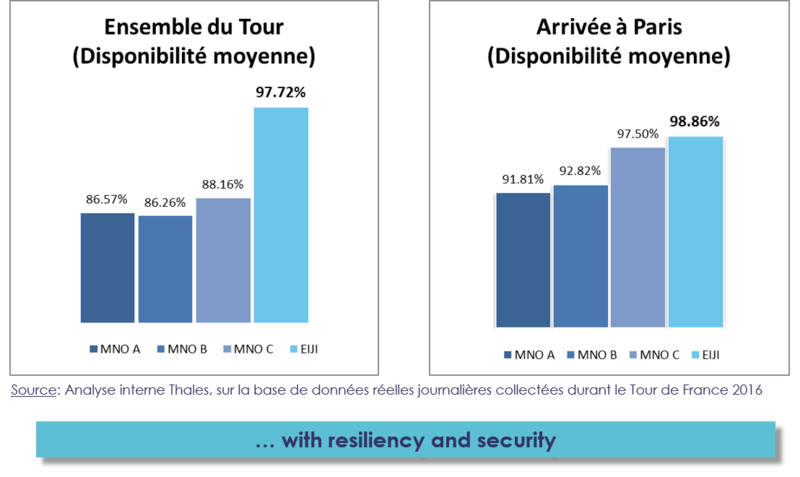 As the network grows, the resilience and the performance of the services increases. Individual availability of three operators vs. combined "hybrid" availability. First a view of the whole tour statistics and second the statistics in Paris. There are also misunderstandings that multiple networks would not together add much to the availability due to site sharing and similar business cases of the operators. In all tests we have conducted this assumption has been proven wrong. We have tens of these tests that show all significant availability boosts. Here as a summary the results of a test conducted by Thales during Tour de France. In these cases, you would suspect network contamination as well as low coverage due to spectator crowds and remote mountain locations of the Tour. Nonetheless, the use of three commercial operators improves the connectivity to a level where it makes the needed difference!